Brings people and communities together - make new friends, volunteering and placement opportunities, activities for children and young people, a safe and secure public green space . . . Delivers education and skill development - hands on enjoyable learning opportunities, short courses, accredited training, school groups . . . Promotes environmental awareness - recycling, composting, wildlife, gardens, ponds, woodland . . . Encourages healthy eating and exercise - wholesome food, exercise through gardening and practical work, cooking events . . . 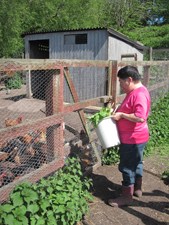 Produces fresh, affordable local food - vegetables, meat, eggs . . Supports people to grow and flourish - providing opportunities to improve mental wellbeing and health.